GALION — Homecoming is always a fun time for Galion students, alumni and the community. This year’s festivities begin with a homecoming pep rally and bonfire, starting about 6:50 p.m., at the football practice fields behind Unckrich Stadium on Thursday, Oct. 5. The Connections Weekend Career Day at Galion Middle School is Friday. On that day, Galion alumni will share their career experiences and insight with high school and middle school students in intimate group settings. On Friday night, the 2017 GHS homecoming queen ant court will be introduced before the football game with Fairbanks. The Galion Alumni Band will perform with the Tigers Marching Band and alumni cheerleaders will join the varsity squad to cheer on the Tigers. The weekend concludes with the annual Alumni Hall of Fame Dinner and Induction Ceremony. This year’s class includes: Arthur Poister (Class of 1916, posthumously), Matthew P. Smith (Class of 1972), Mark Enright (Class of 1979), Dr. Garrett “Lee” Burkam (Class of 1987), Dr. Christopher Bailey (Class of 1997), Edith E. “Judy” Beers (Educator, posthumously). The dinner begins at 6:30 p.m. in the Galion Middle School cafetorium Saturday, Oct. 7. The GHS homecoming dance is also Saturday evening in the high school gym. Courtesy photo The annual Galion City Schools Homecoming and Connections Weekend activities kick off mext Wednesday. The 2017 homecoming court includes: seated, Ashlie Sallee and Huntir Sparks; middle, Teresa House; back row, Elise Barnhart, Kirsten Wagoner, Julie Clouse, Marisa Gwinner, Kayle Clark and Makayla Nickels. https://www.galioninquirer.com/wp-content/uploads/sites/38/2017/09/web1_Galion-2017-football-homecoming.jpgCourtesy photo The annual Galion City Schools Homecoming and Connections Weekend activities kick off mext Wednesday. 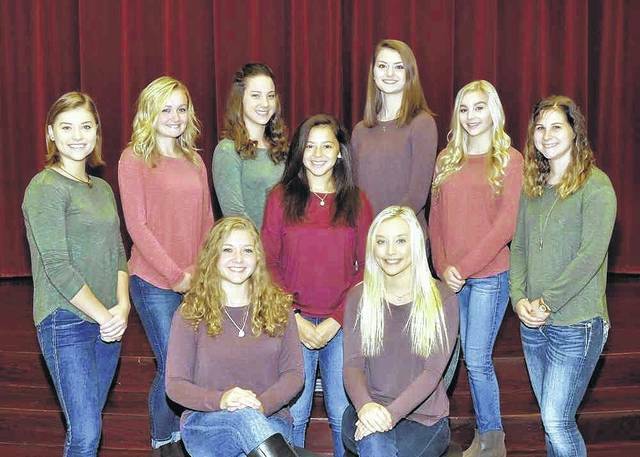 The 2017 homecoming court includes: seated, Ashlie Sallee and Huntir Sparks; middle, Teresa House; back row, Elise Barnhart, Kirsten Wagoner, Julie Clouse, Marisa Gwinner, Kayle Clark and Makayla Nickels.